Interested in starting a testing program, but struggling to get internal support? We know, it’s crazy; but take some comfort in that fact that many marketers still face the same roadblocks as you. And that’s why we created this white paper. 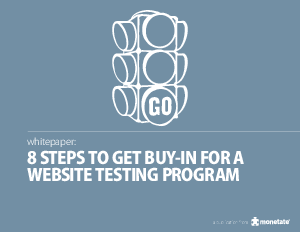 Inside, you’ll find a specific plan on how to convince your company’s leaders that website testing is essential to the overall business. Showing the money being left on the table. Want more details on how you can pull this off? You’ll have to download the white paper.